﻿ Steve MacMeeken is the owner of the Southern Painting regional office that has served North Dallas, Addison, East Plano, Lucas, Murphy, Parker, Richardson, Sachse, and Wylie since 1993. The North Dallas Office of Southern Painting has successfully earned a reputation within the community as an expert in interior and exterior painting that keeps customers coming back when it comes to residential and commercial improvement projects. 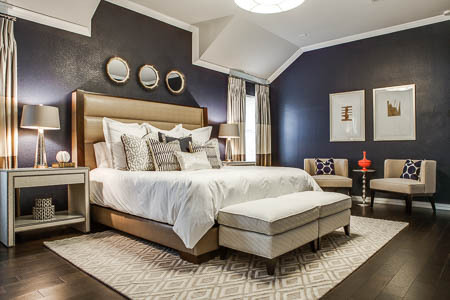 Our philosophy is to go beyond painting and repairs and to provide solutions to North Dallas homes and businesses to make sure what is painted not only looks good but has longevity. We take the time necessary when estimating a job to identify concerns ahead of painting and staining, as it is important to the process of sustaining the longevity of the work performed. Our painting contractors strive to stay updated with interior and exterior painting techniques, applications, trends, color selections and more. At Southern Painting, our painting contractors have experience painting a broad range of residential projects from high-end custom homes to suburban communities both old and new. Our painting contractors excel in the diversity of workmanship they offer, from faux finishes, decorative coffered ceilings, applying paint over paneled walls, staining cabinets, windowsills, doors and baseboards. You can trust our Southern Painting professionals to give you an honest assessment of the scope of your home improvement project at the best possible price. Call our office today to experience the difference that Southern Painting can make for you. Our office serves North Dallas, Addison, East Plano, Lucas, Murphy, Parker, Richardson, Sachse, and Wylie. *Not valid with any other offer. Available at Collin County and North Dallas offices only. Mike and I would like to extend our thanks and appreciation to you and your company for the very fine painting job you recently did in our home. Thank you from the bottom of our hearts!! Your crew did a super fantastic job on the interior and exterior painting of our home!! We are so impressed with your timeliness, courtesy, cleanliness, attention to detail, and honesty that we have referred you all to several friends! It was certainly a treat to come home to such a terrific job!!WOW! Thank you for the thorough and professional exterior paint job. The detailed initial bid left no room for misunderstanding. Your experience helped us address items that we might have otherwise missed. Again, thank you so much.